Congratulations to Tim, Frank Scotty, Greg Tsistinas, Steve Lucas, Brian McCarthy, Frank Femenias, susansmoose, Gary Hammond, Art K., and Joe Oesterle for correctly identifying last Friday's Mystery Foto. This amazing aerial is relevant to the Long Island Motor Parkway, the Vanderbilt Cup Races and the history of Long Island. -What is the major clue to determining the date? 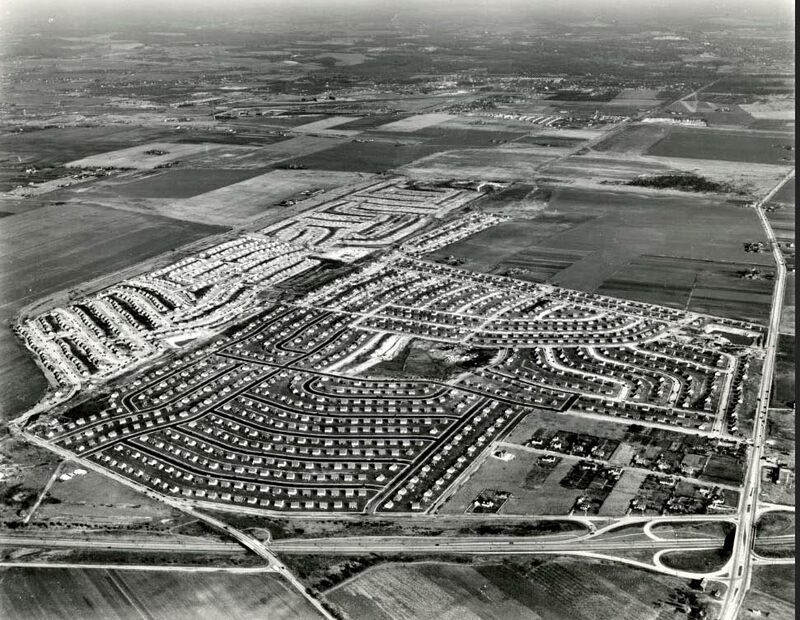 The absence of Levitt homes in the aerial. Construction was being set up on the right side, north of Hempstead Turnpike. -Which years were the Vanderbilt Cup Races held on sections of the courses seen in this photo? The Motor Parkway section of the course (on the left) for the 1908, 1909 and 1910 Vanderbilt Cup Races. 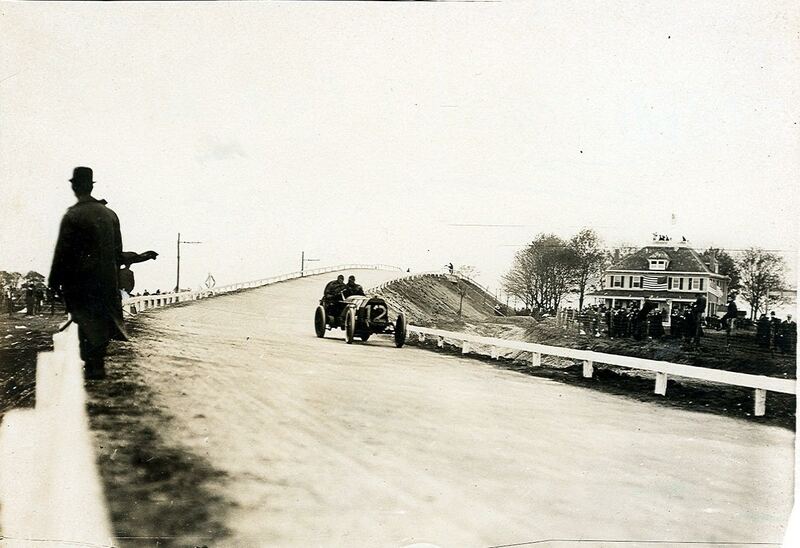 And...Hempstead Turnpike for the 1904 Vanderbilt Cup Race. -How many Motor Parkway bridges can be seen in this aerial? Starting from the bottom left corner, the Motor Parkway bridges (standing and taken down) were; the Wantagh State Parkway (built in 1937 by New York State), Newbridge Road, Jerusalem Avenue, farmway bridge near current Bloomingdale Road, and three more in the distance (Wantagh Avenue, Massapequa-Hicksville Road and Jerusalem Road). -Which active or former airfields can be seen in this aerial? The Long Island Aviation Club to the north of the Motor Parkway, Grumman Aviation Field in the left corner, and Gulf Field near the bottom center. If you have a candidate for a Mystery Foto, please send a jpegs to Howard@Kroplick.com . Look forward to seeing all you hikers and bikers tonight in Dix Hills. Spectators watching the 1909 Vanderbilt Cup Race. Note the grandstand south of the Motor Parkway in the background. 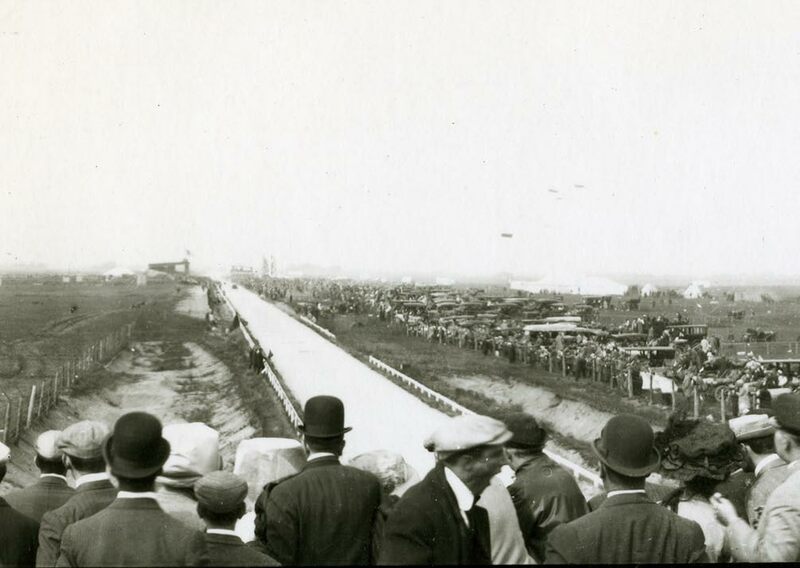 Opening day of the Motor Parkway on October 10, 1908. The car in the photo is the G28 Sharp Arrow, winner of the Garden City Sweepstakes. Note the spectators watching the 1908 Vanderbilt Cup Race at the Newbridge Hotel. Looking eastward over Island Trees, present day Levittown. At bottom of photo, left to right, is the Wantagh State Parkway, spanned by the LIMP on the left; the Newbridge Rd span in the center; then the cloverleaf at Hempstead Tpkke. on the right. There is a LIMP bridge (Jerusalem Avenue) at the top center; the Bloomingdale Rd. bridge is center left. In the far center are the Wantagh Avenue and Hicksville Rd. (Massapequa Lodge) bridges.The date is about 1946. 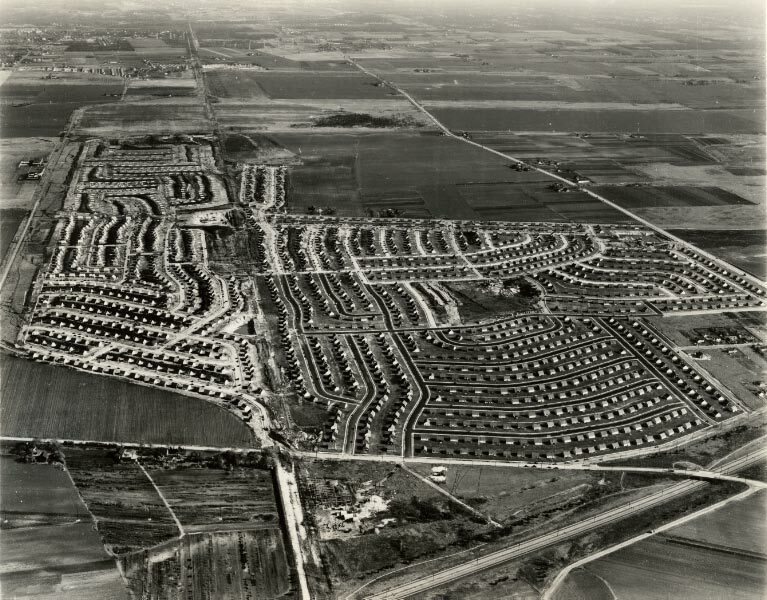 There are no Levitt homes yet (1947-1951). There are several homes at the bottom right which were pre-Levittown. 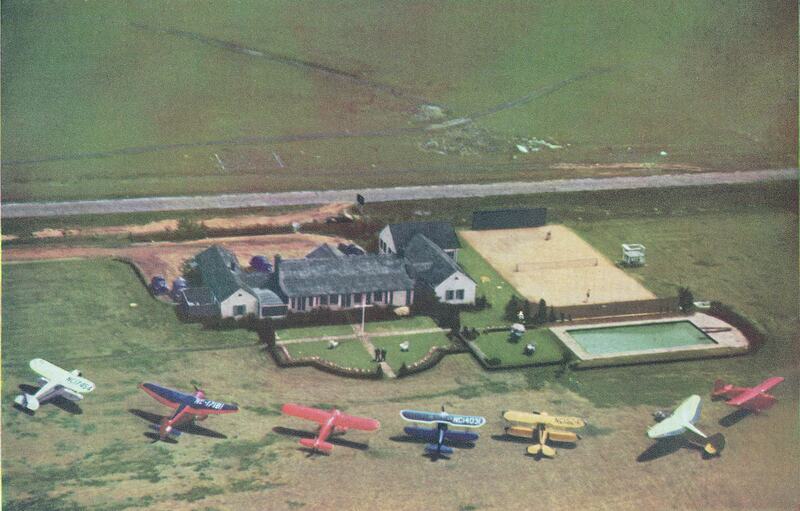 Gulf Flying Field existed near the bottom center. There was another airfield at the center right on the south side of Hempstead Tpke. where St. Bernard’s Church now stands. Near the top left stood the Hicksville Aviation Country Club. Races held here—1908, 09 10. Easy one.This is the future Levittown with the Motor Parkway in left center and the Wantagh Parkway at the bottom. This is were the grandstands were and one of the oldest sections of the Parkway. This is an aerial view looking east towards Levittown. The year is 1947 as there are no Levitt houses built yet and the Wantagh Parkway can be seen at the bottom of the image. 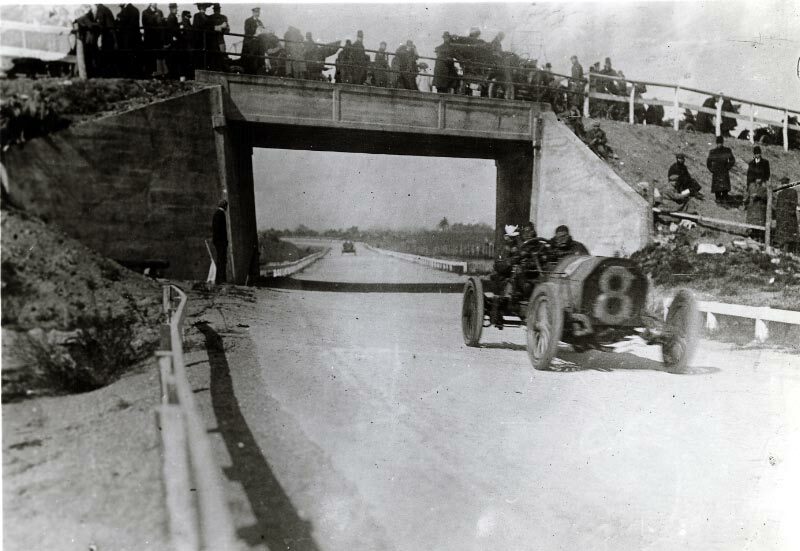 There are 3 ““Motor Parkway “” bridges in the photo, 2 of them, the Jerusalem Avenue and Newbridge Road bridges were used in the 1908,1909 and the 1910 Vanderbilt Cup Races. The 3rd bridge is the one going over Wantagh Parkway that was built later.The Long Island Aviation Club hangars are to the north side of the L.I.M.P. towards the top of photo. The photo appears to be looking east over what in a few years will become Levittown. 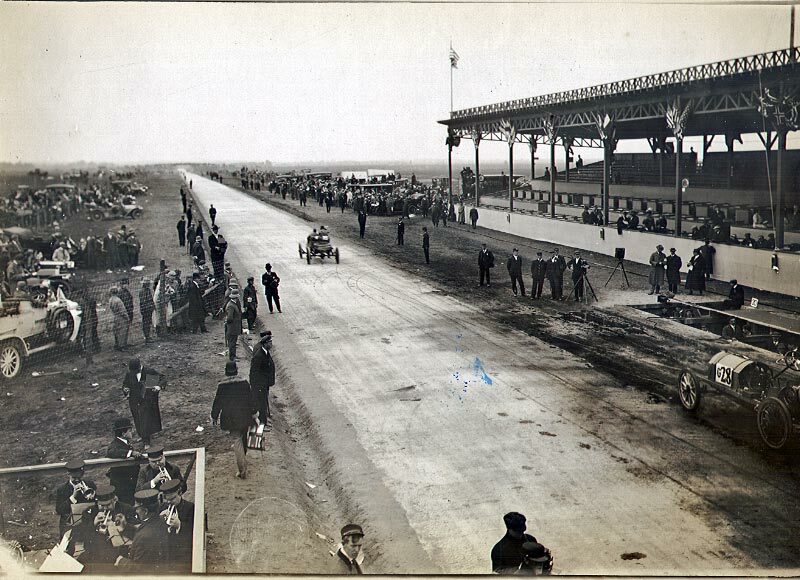 The grandstand area is visable which served as part of the course for the 1908, 1909, and 1910 races. It is probably early 1938 since there are a few LIMP bridges still functional (I think I can see 4) and the northern extension of the Wantagh Parkway looks almost ready for traffic but didn’t open until December, 1938. I think I can see Grumman’s Bethpage airfield and the old Aviation Country Club field. This is an easy photo to id. Looking East, with the Wantagh State Pkwy at the bottom and Farmingdale at the top. Hempstead Tpke on right, Newbridge Rd on angle at bottom, Motor Pkwy on left with the 2 bends in the road, going past the Aviation Country Club in Hicksville (notice the clubhouse), Republic Airport in distance at the top. Location of Central RR tracks running across the center on slight angle. Date pre-1947 - before Levittown, probably between 1939 and 1945. Hi - just about in my backyard! Location is looking east through Levittown, Island Trees and Bethpage. The Motor Parkway enters on the left crosses the Wantagh Parkway extension and Newbridge Road, then veers north to the Grandstand area (the straightaway) and then back a little south and east heading to Dead Man’s Curve (can’t pick that out however). Hempstead Turnpike is on the right side of the photo. The photo has to be between 1938 and 1947 as that was the period the Wantagh Parkway extension to the Northern State Parkway was built (so probably closer to 1947 as the extension looks pretty much complete). Also, no Levitt homes are seen which would have been noticed following 1947. Also the Aviation Country Club, on the north side of the Parkway which i think is the group of buildings in the center of the straightaway was closed in 1948. Vanderbilt Cup Races were used this section in 1908, 1909 and 1910. Either 5 or 6 Motor Parkway bridges: There was the 1) Westbury Ave. bridge but I don’t believe that’s on the photo (would have been to the left of the Wantagh Parkway). Then there would be the 2) Newbridge Road bridge, 3) Jerusalem Ave. bridge (just east of the Aviation Country Club) , the 4) Blooomington Rd. farmway bridge, the 5) Wantagh Avenue bridge , and with good eyes or a magnifying glass, 6) the Massapequa/Hicksville Road Bridge. I’m counting the Wantagh Parkway bridge that I imagine went over the Motor Parkway/Westbury Road. As mentioned the LI Aviation Country Club is on the north side of the Motor Parkway and also Grumman Airport is to the east and north. Levittown, looking east. LIMP at Left.